John Hunt lifts the Liam MacCarthy Cup. THE LATE LATE show returned to screens on Friday night and sport was a prominent feature throughout. Ireland’s silver medalists at the Hockey World Cup made an appearance as did athletes Thomas Barr, Ellen Keane and Rhys McClenaghan, who all won medals at the European and Para-European championships this year. But the star of the show was undoubtedly Limerick fan John Hunt who was introduced during a segment which featured the All-Ireland winning heroes from his native county. 98-year-old Hunt has been living in Chicago for some 70 years and was there to witness Limerick win the 1936 All-Ireland hurling final. 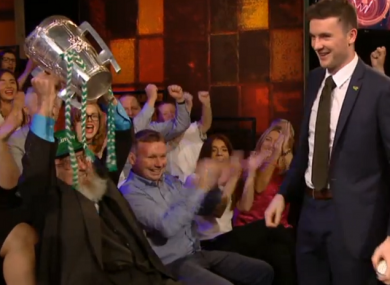 He also got the chance to lift the Liam MacCarthy Cup in a heartwarming scene on the Late Late Show. “If St Peter gets me at the gate, I couldn’t be happier,” said Hunt about watching Limerick end a 45-year wait for another senior All-Ireland title this year. Declan Hannon then brought the trophy over to Hunt who stretched out to shake the team captain’s hand before lifting the Liam MacCarthy up high to huge applause from the crowd. “It feels great after 45 years,” he then shouted with joy as the cheering continued in the audience. To top it all off, Hannon then presented Hunt with the match ball from the All-Ireland final against Galway. You can watch the section with the Limerick hurling team on the Late Late Show here and the full episode on the RTÉ Player here. Email “'If St Peter gets me at the gate, I couldn't be happier:' 98-year-old Limerick fan stars on The Late Late Show”. Feedback on “'If St Peter gets me at the gate, I couldn't be happier:' 98-year-old Limerick fan stars on The Late Late Show”.